Rising Sea Level is the most profound long-term aspect of climate change. Yet, the public is almost completely unaware of the magnitude of the problem. For three million years sea level regularly moved up and down almost 400 feet with the ice age cycles. Now, after 6,000 years of minimal change, we are entering a new era of rapid sea level rise. The science behind sea level rise, plus the myths and partial truths used to confuse the issue. The surprising forces that will cause sea level to rise for 1,000 years, as well as the possibility of catastrophic rise this century. Why the devastating economic effects will not be limited to the coasts. Why coastal property values will go “underwater” long before the land does, perhaps as early as this decade. Five points of “intelligent adaptation” that can help individuals, businesses, and communities protect investments now and in the future. "Read this book...the clearest statement to date about the frightful reality of accelerating sea level rise and the catastrophic impacts...a crisis beyond anything civilization has encountered. Englander shows what we must begin doing now to slow this change and examines the adaptation options we have for our communities, countries and Earth." "My students and I found High Tide to be very useful and very readable and I most certainly would use the book again." "High Tide On Main Street provides clear and convincing explanations for the phenomenon of sea level rise that are accessible even to a readership encountering the data for the first time." "An excellent read. This book provides a synthesis of the state of the art in scientific understanding of sea level; past, present and future; and paints a clear picture of the implications for us and for future generations." High Tide on Main Street is the culmination of Mr. Englander's five years of extensive research on sea level rise; decades of experience as an oceanographer and explorer; and dual degrees in geology and economics. The book has received rave reviews from some of the top climatologists and climate leaders. 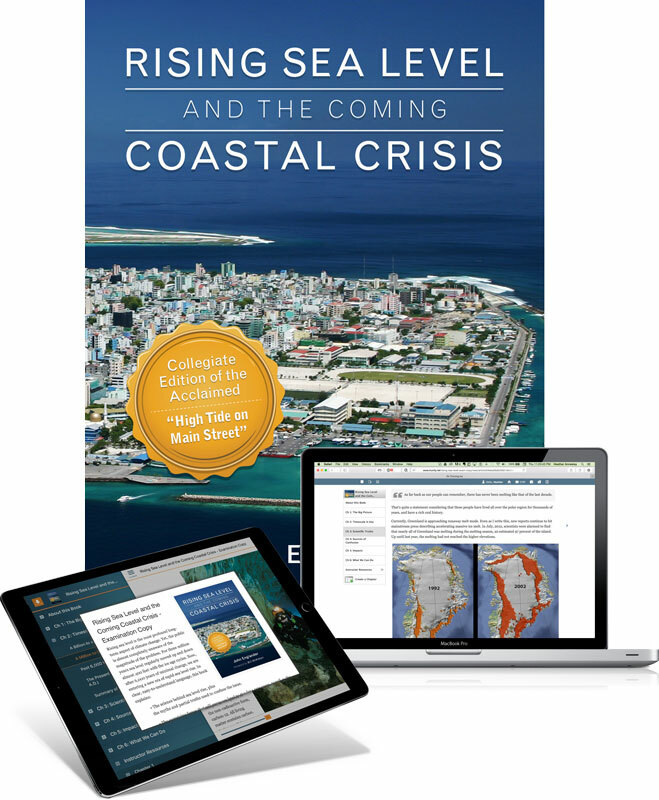 Dr. Robert Corell, lead author of the U.S. National Climate Assessment, said, "This brilliantly-written book commands our attention to the challenges we face as sea level rises at rates unknown to modern humankind. Englander manages to capture the grand sweep of sea level rise over geologic history while also presenting projected future changes in ways that are very convincing, and daunting." Renowned oceanographer and former NOAA Chief Scientist, Dr. Sylvia Earle calls it, "a must read, no matter where on the planet you live." And yes, he would be happy to speak with you! John Englander is an oceanographer, consultant and sea level rise expert. His broad marine science background coupled with degrees in geology and economics allows him to see the big picture on climate and look ahead to the large-scale financial and societal impacts, particularly as they relate to sea level rise. He brings the diverse points of view of an industry scientist, entrepreneur and CEO. For over 30 years, he has been a leader in both the private sector and the non-profit arena, serving as CEO for such noteworthy organizations as The Cousteau Society and The International SeaKeepers Society. As the Founder of the Rising Seas Group, he works with businesses, government agencies, and communities helping them understand the financial risks of sea level rise. His best selling book, High Tide On Main Street: Rising Sea Level and the Coming Coastal Crisis, clearly explains the science behind sea level rise, the impending devastating economic impacts and the "intelligent adaptation" that all businesses and coastal communities must consider today. Mr. Englander’s recent media appearances include MSNBC, Fox Business Channel, Al Jazeera America, ABC, CCTV (China), National Public Radio (NPR), and SkyNews TV-UK. He has been featured in USA Today, Huffington Post, the San Francisco Chronicle, and Publisher’s Weekly. Visit Mr. Englander’s website on sea level rise.